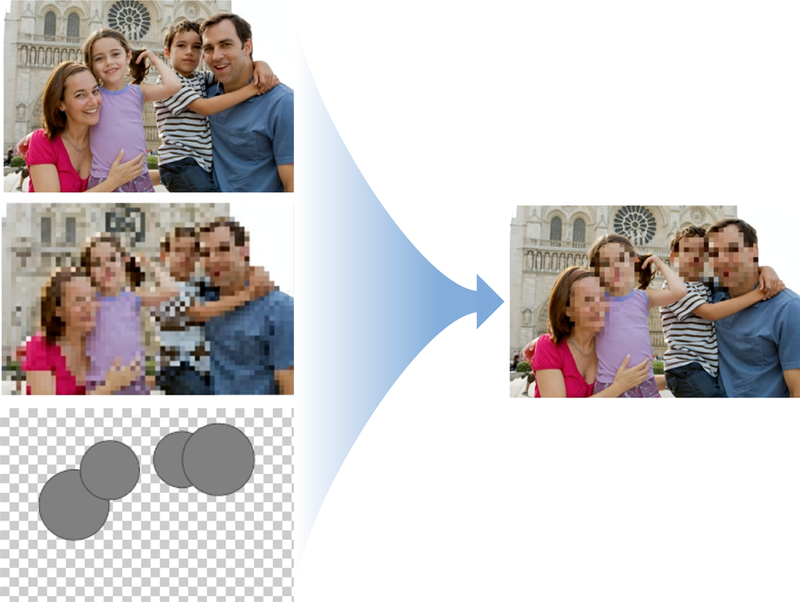 You can create custom effects by using the output of one image filter as the input of another, chaining as many filters together as you’d like. When you create an effect this way that you want to use multiple times, consider subclassing CIFilter to encapsulate the effect as a filter. This chapter shows how Core Image subclasses CIFilter to create the CIColorInvert filter. Then it describes recipes for chaining together a variety of filters to achieve interesting effects. By following the subclassing procedure in Subclassing CIFilter to Create the CIColorInvert Filter, you should be able to create filters from the recipes in this chapter or venture forth to create your own interesting combinations of the built-in filters provided by Core Image. When you subclass CIFilter you can modify existing filters by coding them with preset values or by chaining them together. Core Image implements some of its built-in filters using this technique. Declare properties for the filter’s input parameters. You must prefix each input parameter name with input, such as inputImage. The CIColorInvert filter provided by Core Image is a variation on the CIColorMatrix filter. As its name suggests, CIColorInvert supplies vectors to CIColorMatrix that invert the colors of the input image. Follow the simple example shown in Listing 5-1 and Listing 5-2 to build your own filters. CIFilter *filter = [CIFilter filterWithName:@"CIColorMatrix"
Removes a color or range of colors from a source image and then composites the source image with a background image. Create a cube map of data that maps the color values you want to remove so they are transparent (alpha value is 0.0). Use the CIColorCube filter and the cube map to remove chroma-key color from the source image. The sections that follow show how to perform each step. You need to remove all the green from the image by setting green to alpha = 0.0, which makes it transparent. “Green” encompasses a range of colors. The most straightforward way to proceed is to convert the color values in the image from RGBA to HSV values. In HSV, hue is represented as an angle around the central axis of a cylinder. In that representation, you can visualize color as a pie slice and then simply remove the slice that represents the chroma-key color. To remove green, you need to define the minimum and maximum angles around the central access that contain green hues. Then, for anything that’s green, you set its alpha value to 0.0. Pure green is at a value corresponding to 120º. The minimum and maximum angles need to center around that value. Cube map data must be premultiplied alpha, so the final step for creating the cube map is to multiply the RGB values by the alpha value you just computed, which is either 0.0 for green hues or 1.0 otherwise. Listing 5-3 shows how to create the color cube needed for this filter recipe. Now that you have the color map data, supply the foreground image—the one you want the green removed from—to the CIColorCube filter and get the output image. Set inputImage to the image produced from the CIColorCube filter. Set inputBackgroundImage to the image that shows the new background. This example uses a beach image. The foreground image now appears as if it is on the beach. 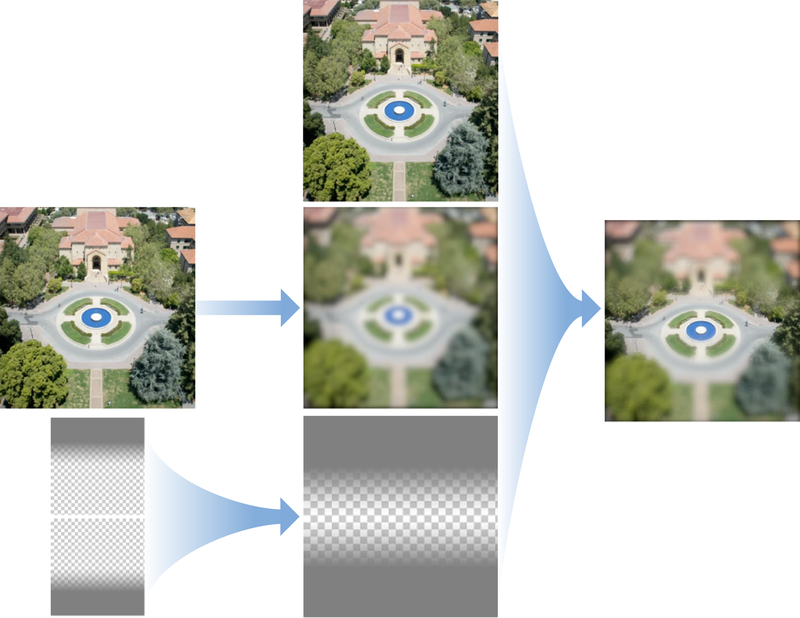 Increases the brightness of an image at the periphery of a face detected in an image. Find the human face in an image. Create a base shade map using CIRadialGradient centered on the face. Blend the base shade map with the original image. Use the CIDetector class to locate a face in an image. The first item in the array that featuresInImage:options: returns is the face the filter operates on. After you have the face, calculate the center of the face from the bounds provided by the detector. You need the center value to create the shade map. Listing 5-4 shows how to locate a face using CIDetector. Use the CIRadialGradient filter to create a shade map centered on the face. The center of the shade map should be transparent so that the face in the image remains untouched. The edges of the map should be opaque white. Areas in between should have varying degrees of transparency. Set the inputCenter to the center of the face bounds that you computed with Listing 5-4. Set inputImage to the original image. Set inputBackgroundImage to the shade map produced in the last step. Selectively focuses an image to simulate a miniature scene. Create a blurred version of the image. Create a mask by compositing the linear gradients. Composite the blurred image, the mask, and the original image. Set inputImage to the image you want to process. Set inputRadius to 10.0 (which is the default value). Set inputImage to the first linear gradient you created. Set inputBackgroundImage to the second linear gradient you created. Set inputImage to the blurred version of the image. Set inputBackgroundImage to the original, unprocessed image. Set inputMaskImage to the mask, that is, the combined gradients. The mask will affect only the outer portion of an image. The transparent portions of the mask will show through the original, unprocessed image. The opaque portions of the mask allow the blurred image to show. Finds faces in an image and pixellates them so they can’t be recognized. Create a pixellated version of the image. Build a mask using the faces detected in the image. Blend the pixellated image with the original image using the mask. Set inputImage to the image that contains the faces. Set inputScale to max(width, height)/60 or another value that seems pleasing to you, where width and height refer to the image’s width and height. Use the CIRadialGradient filter to create a circle that surrounds the face. Use the CISourceOverCompositing filter to add the gradient to the mask. Set inputImage to the pixellated version of the image. Set inputBackgroundImage to the original image. Set inputMaskImage to to the composited green circles. Transitions from one image to another by pixelating each image. Use CIDissolveTransition to transition between the source and destination images. Pixellate the result of the transition filter. Set inputTime to a value similar to min(max(2*(time - 0.25), 0), 1), which is a ramp function that’s clamped between two values. Decreases the quality of a video image to make it look like an old, scratchy analog film. Apply the CISepiaTone filter to the original video image. Create randomly varying white specks. Create randomly varying dark scratches. Composite the specks and scratches onto the sepia-toned image. Use the CIRandomGenerator filter, which produces colored noise. It does not have any input parameters. An alternative to using CIAffineTransform is to transform the noise using the imageByApplyingTransform: method. This results in cyan-colored scratches. To make the scratches dark, apply the CIMinimumComponent filter to the cyan-colored scratches. This filter uses the minimum value of the r,g,b, values to produce a grayscale image.